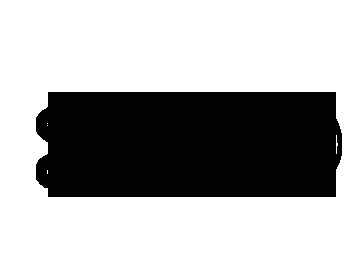 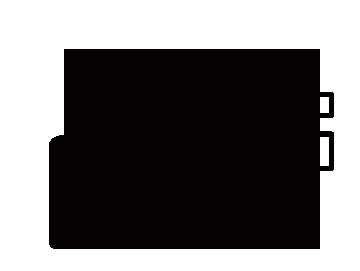 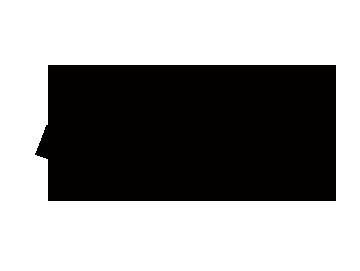 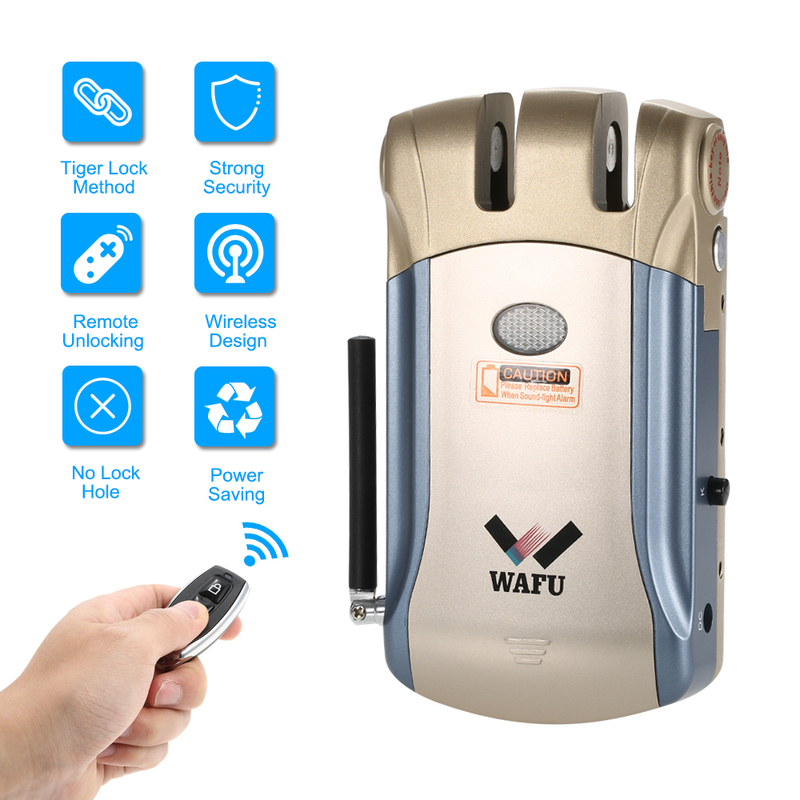 Remotely control traditional wired video by Smartphones anywhere any time. 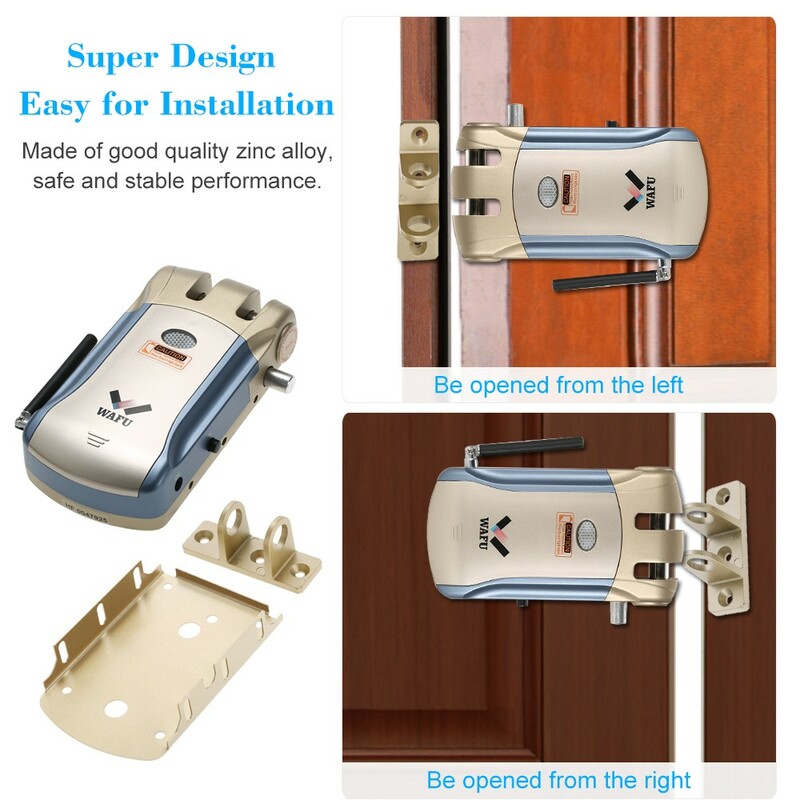 *No lock hole design, it completely abandons the traditional key and lock, in the fully opened and closed by remote control, realized the real security. 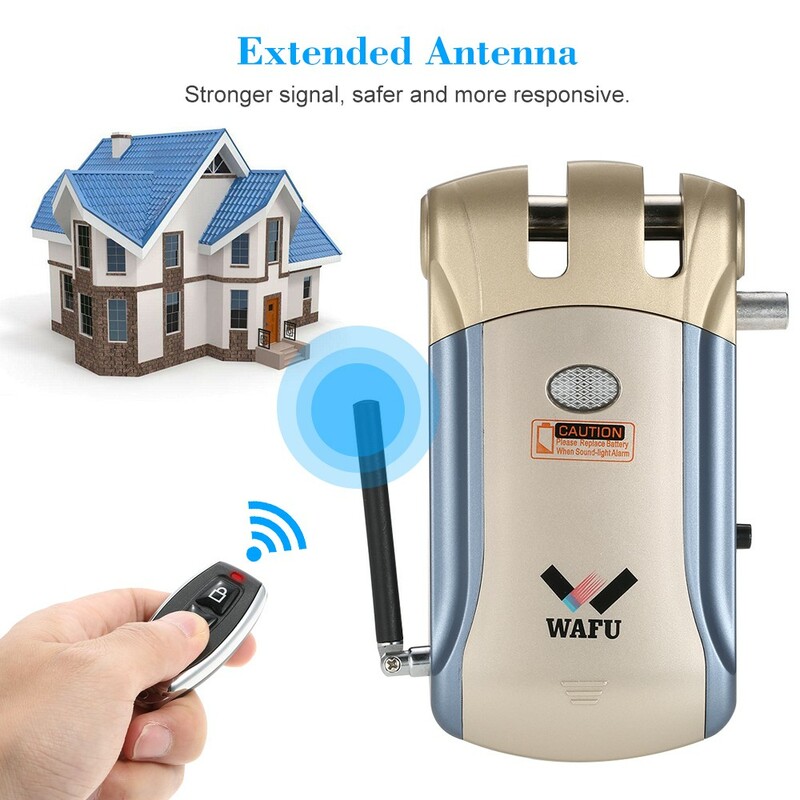 *Extended antenna, stronger signal, safer and more responsive. 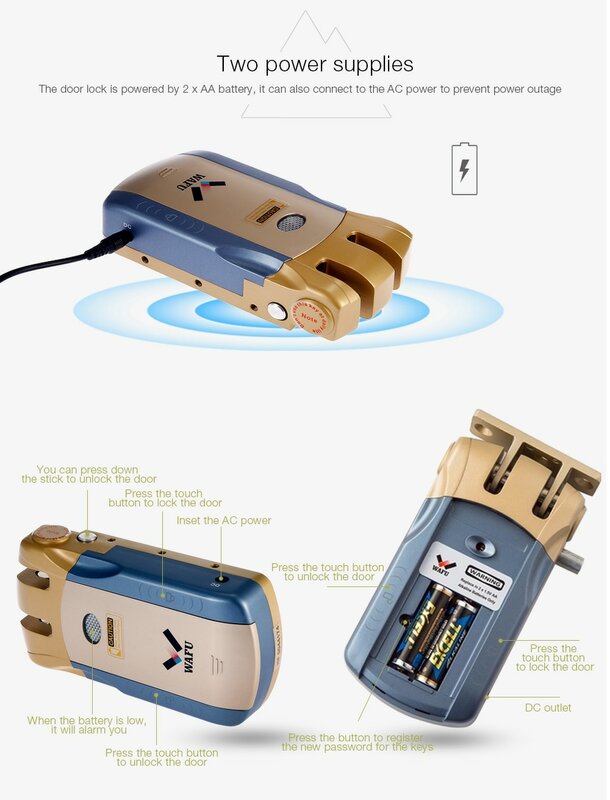 *Add USB external power source function. 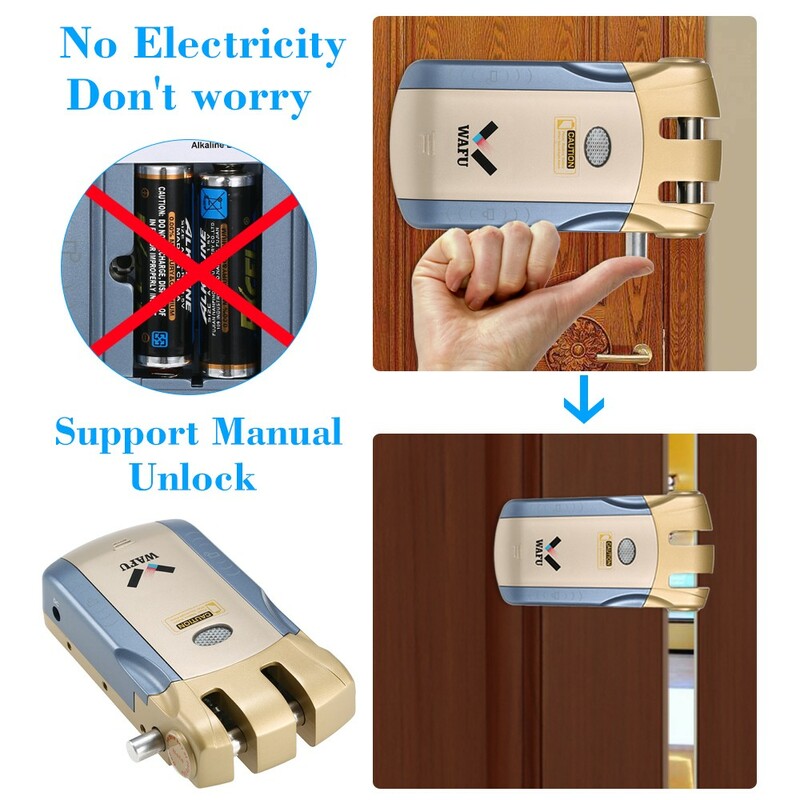 Make sure the lock works when battery (not included) was dead. 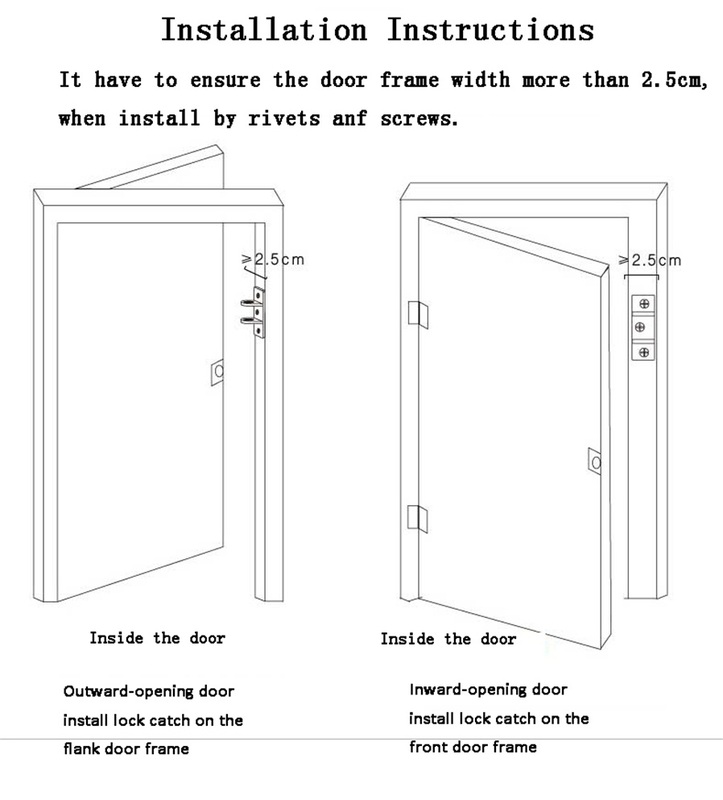 *Easy installation on all kind of doors, very convenient. 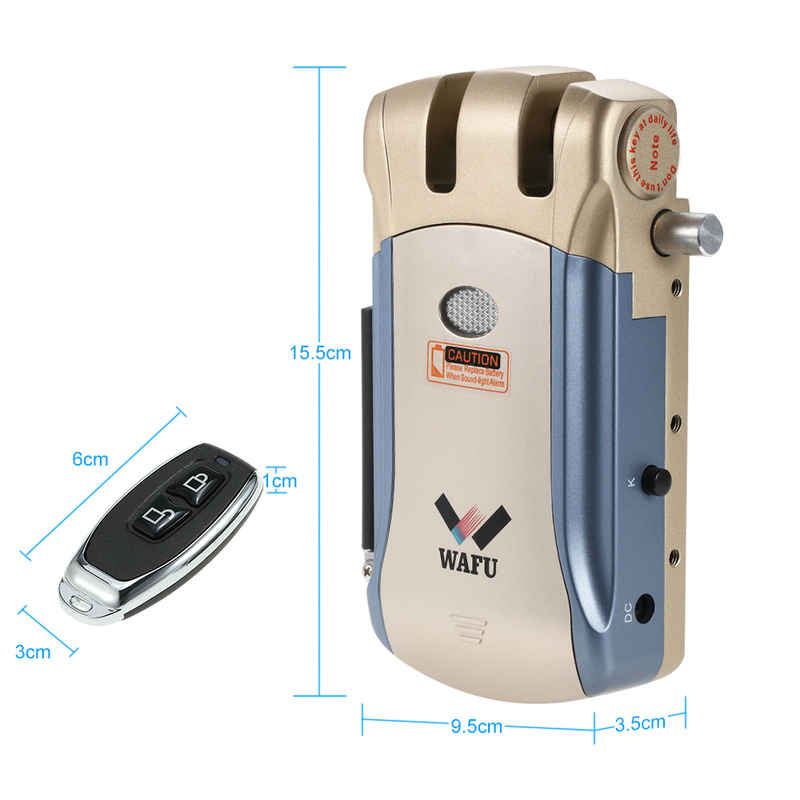 Without hole design, Open or close the lock with a remote control, completely safe and security. 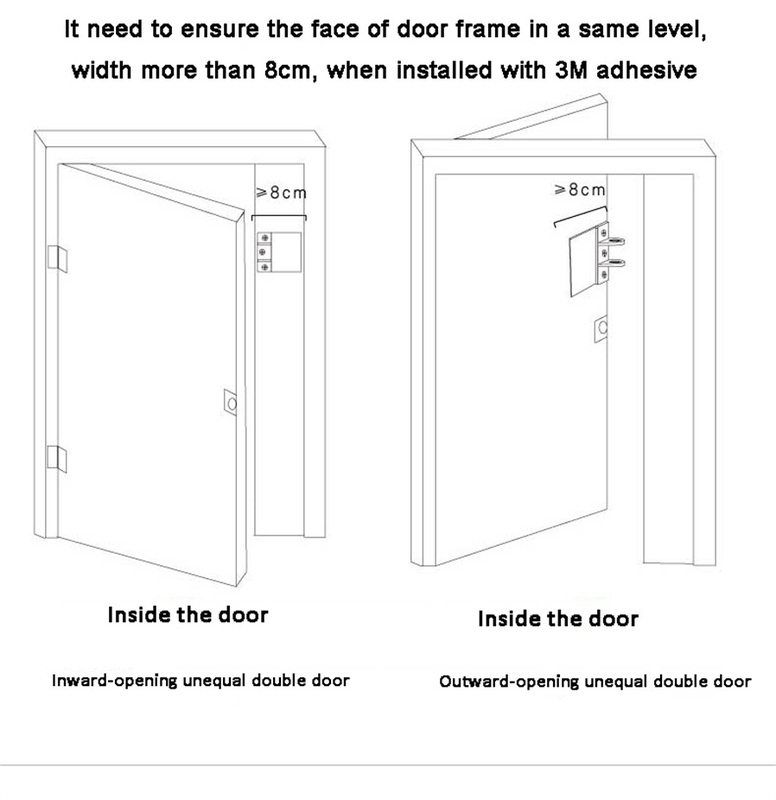 Easy installation on all kind of doors:wood,metal,glass,ect. 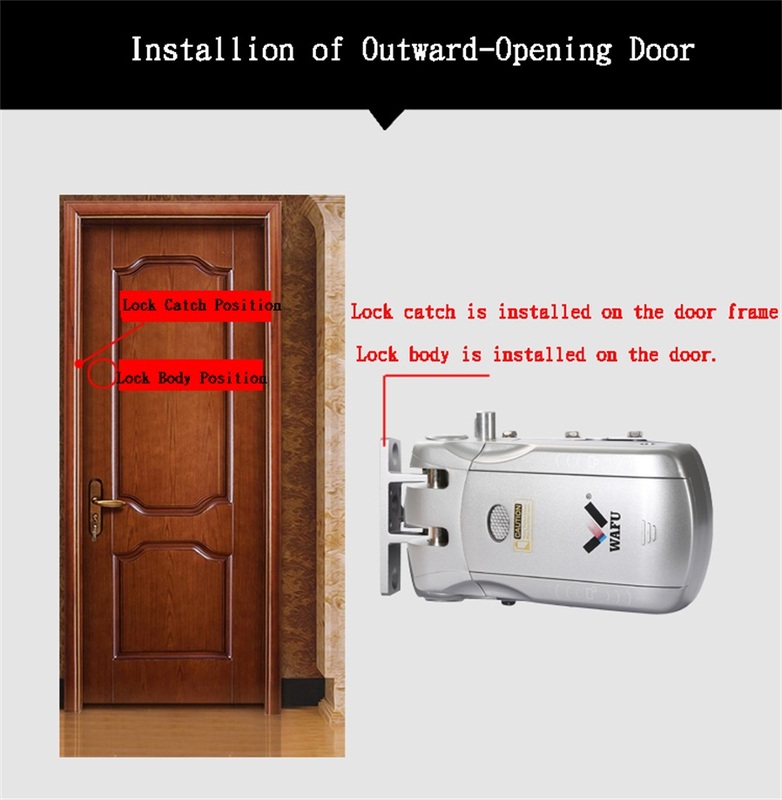 Internal unblocking system for emergencies. 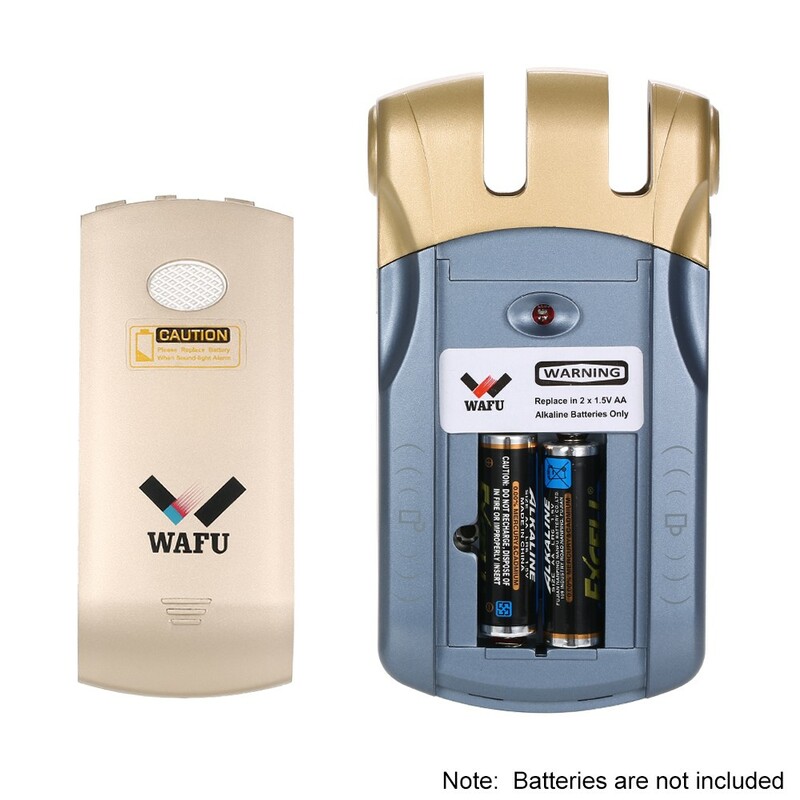 -When the battery is low, the LED light flickers, buzzer alarm, means that charge is necessary. 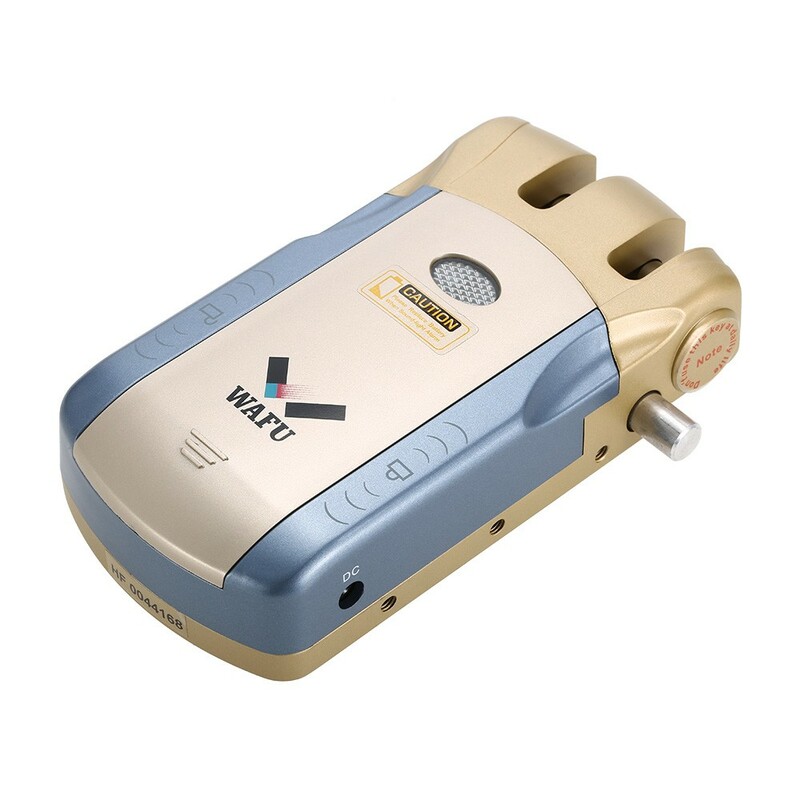 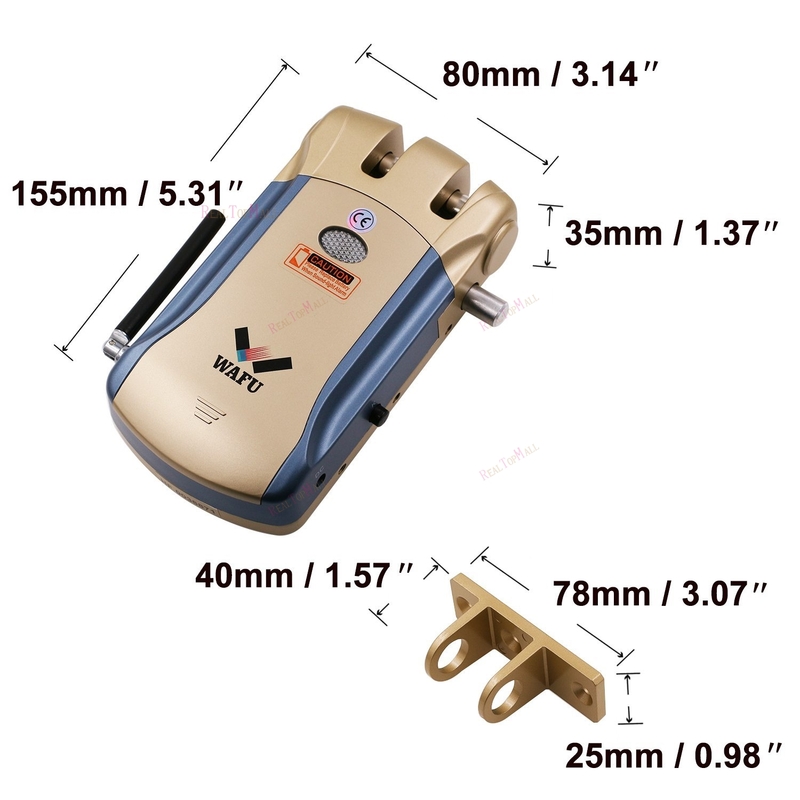 -Remote control maximum Effective Range up to 10m(without obstacles). 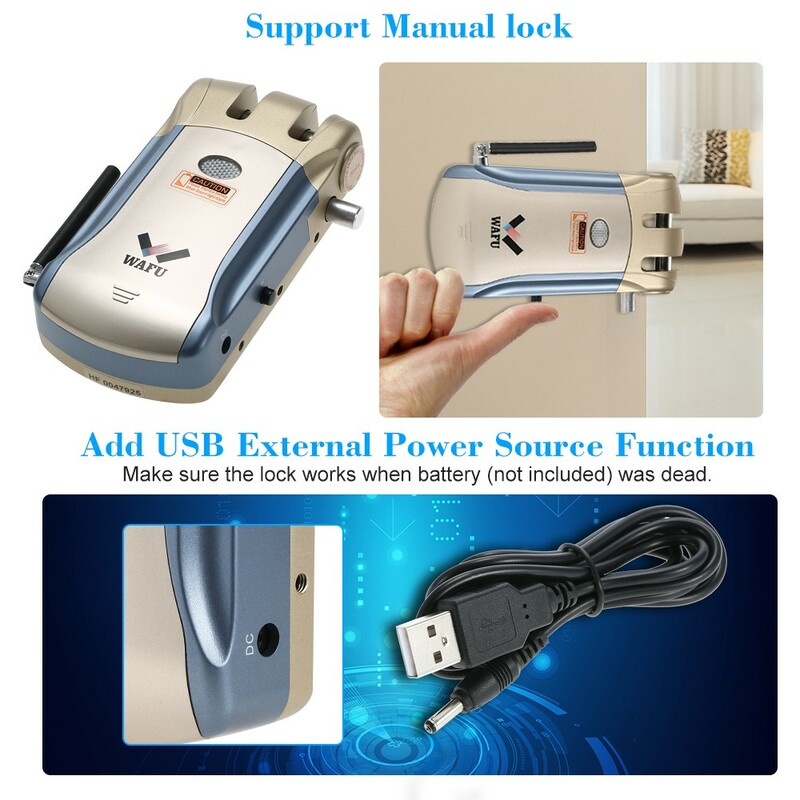 -Add USB external power source function.Make sure the lock works when battery was dead. 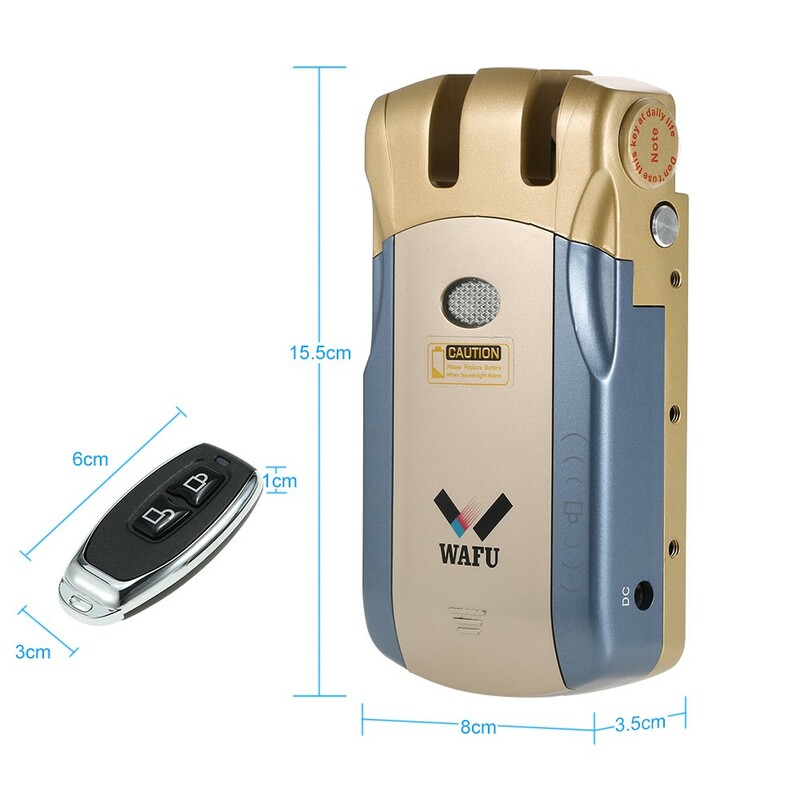 -When the battery is under voltage 1.9V, the lock will open automatically.Avoiding barred you out. 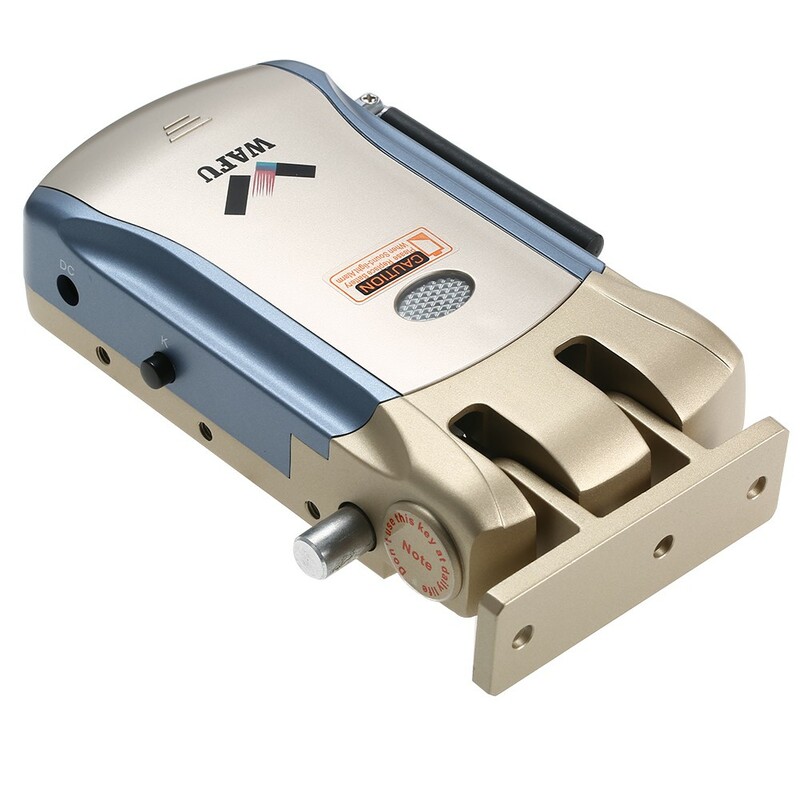 -Link many eletronic door locks with the same remote control. 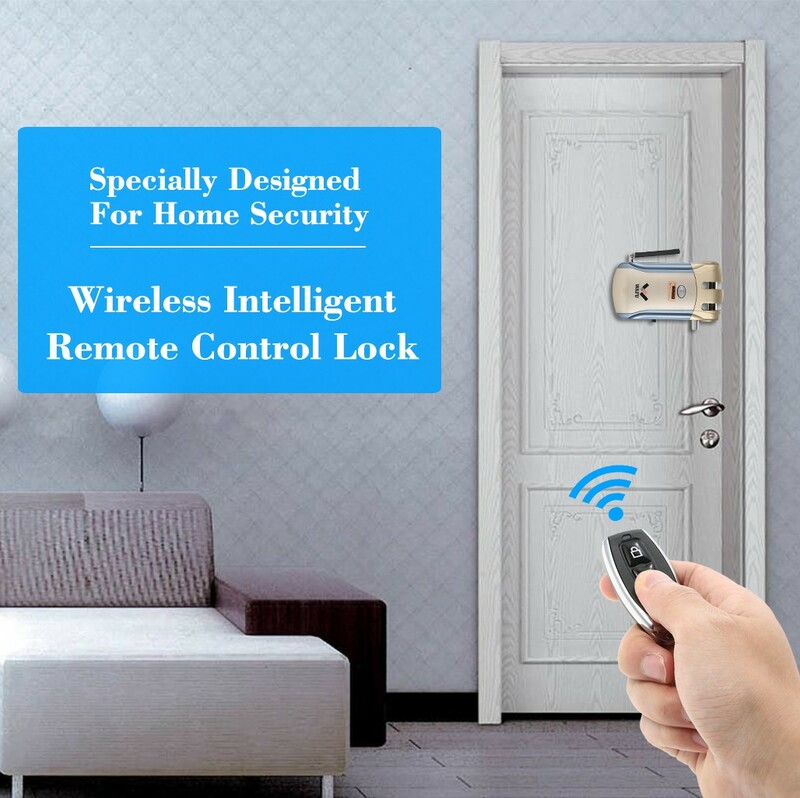 -Reallocation coding function:If you lost the remote control.Just use a new remote control to set the code with lock.The lost one will be invalid. 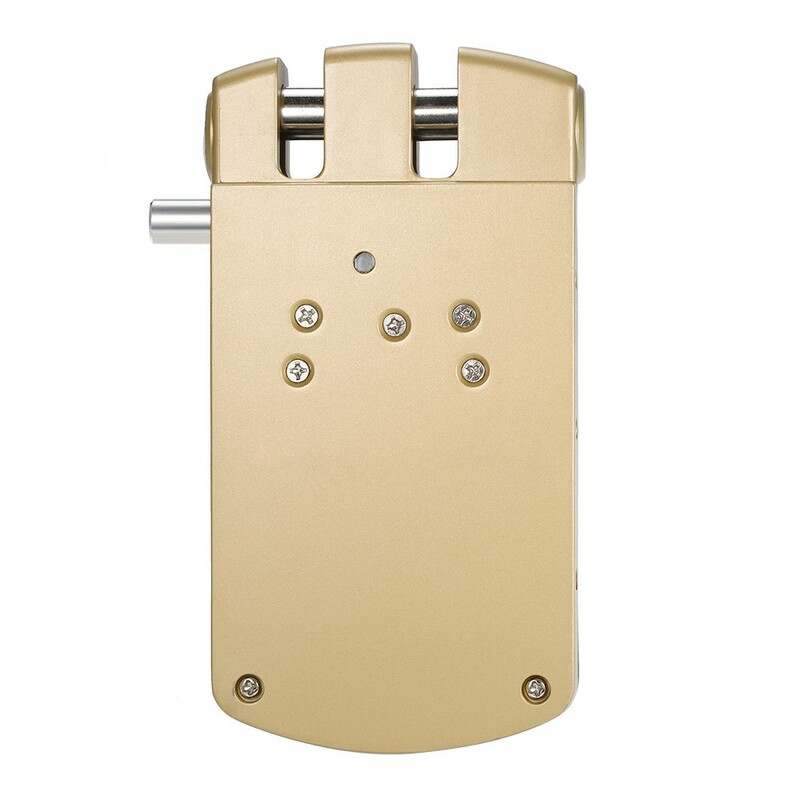 -A body casting:Structure of the tiger button, lock body using zinc alloy casting, pry proof performance is outstanding, more safe and reliable. 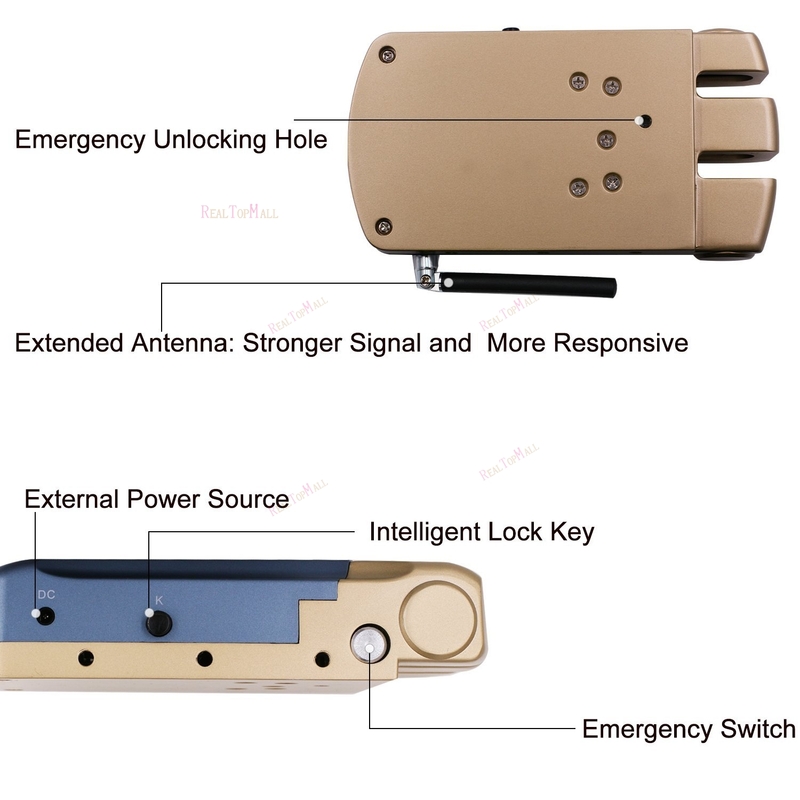 -Emergency Release Button:In an emergency, only need to press the emergency open button, lock will open automatically, facilitate emergency escape,ensure the safety of life. 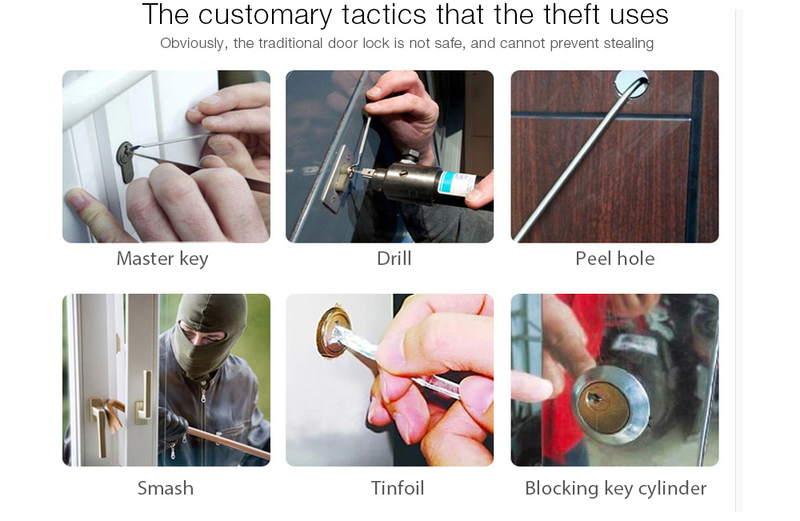 Avoid the method most used by thieves, BUMPING. 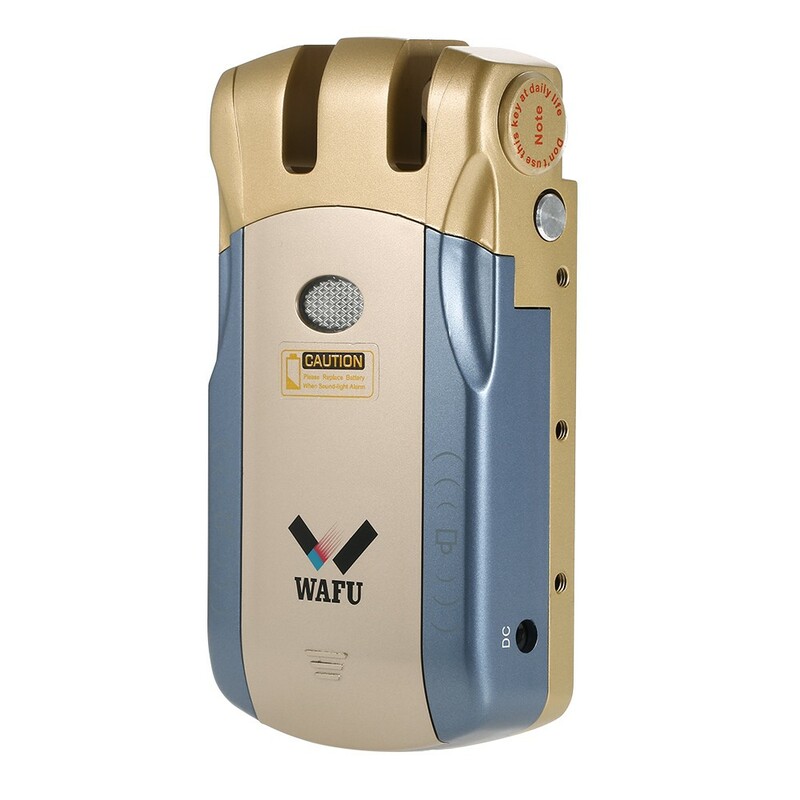 Protects from the famous extraction method. 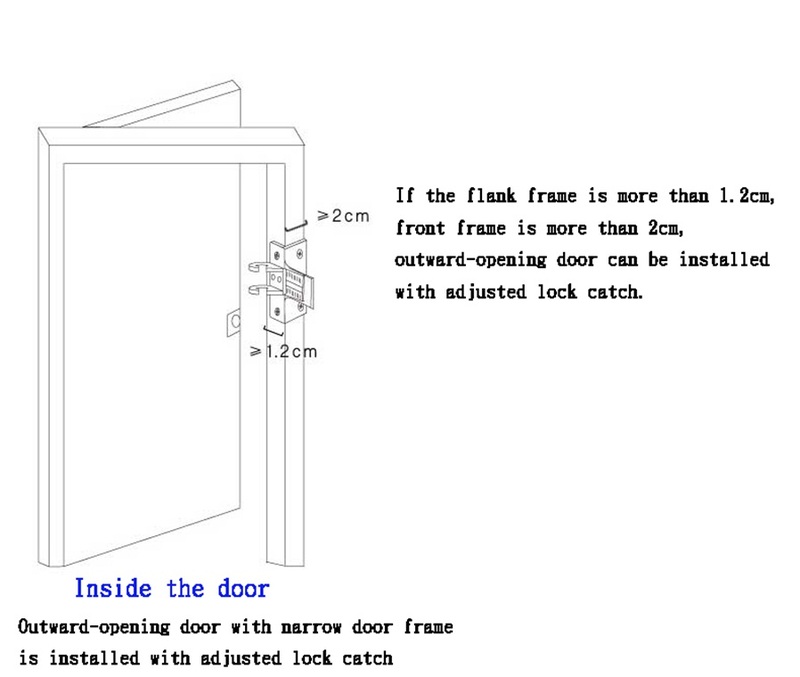 The lock is installed inside. 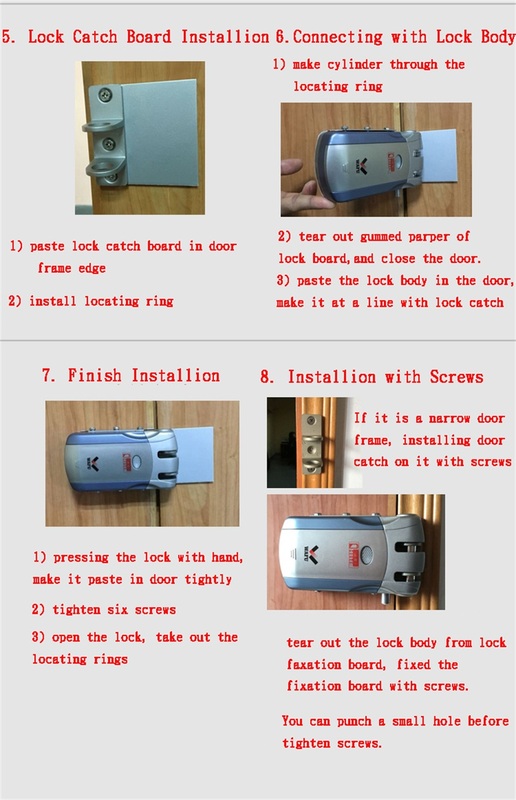 You can not force it with a drill. 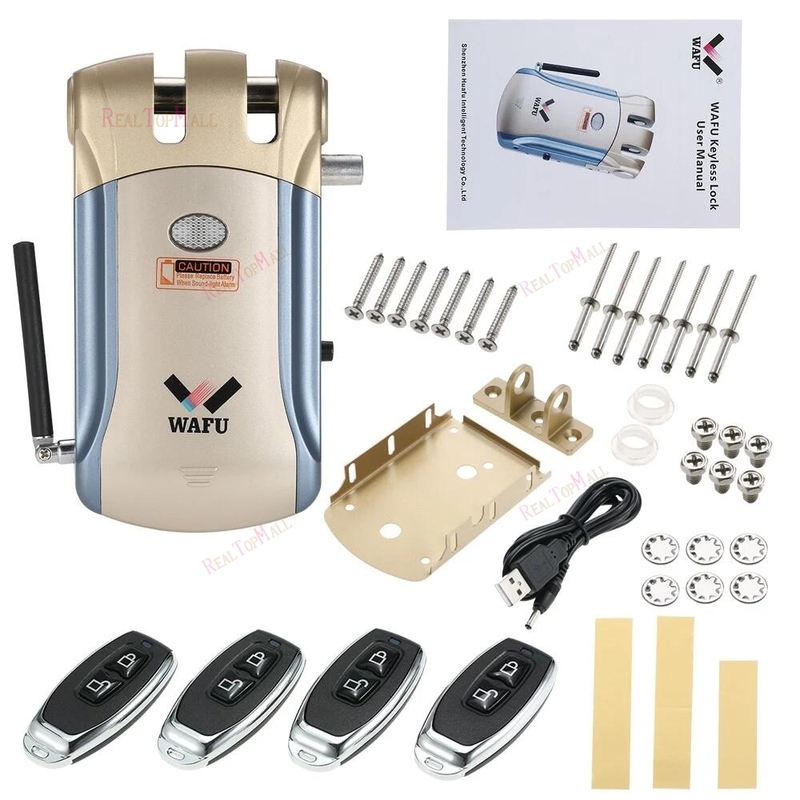 It can not be forced with a picklock or master key. 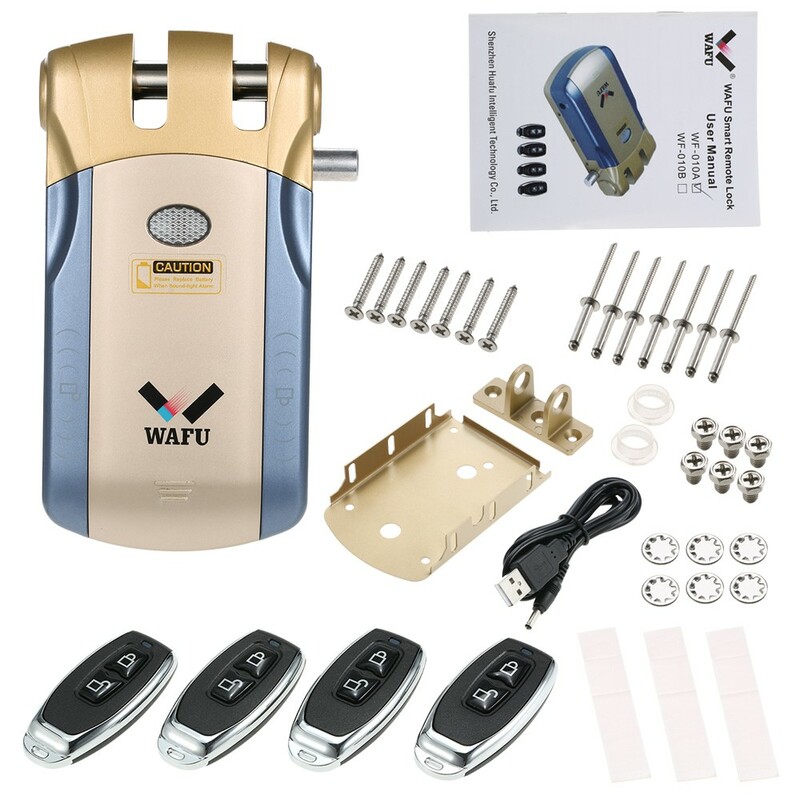 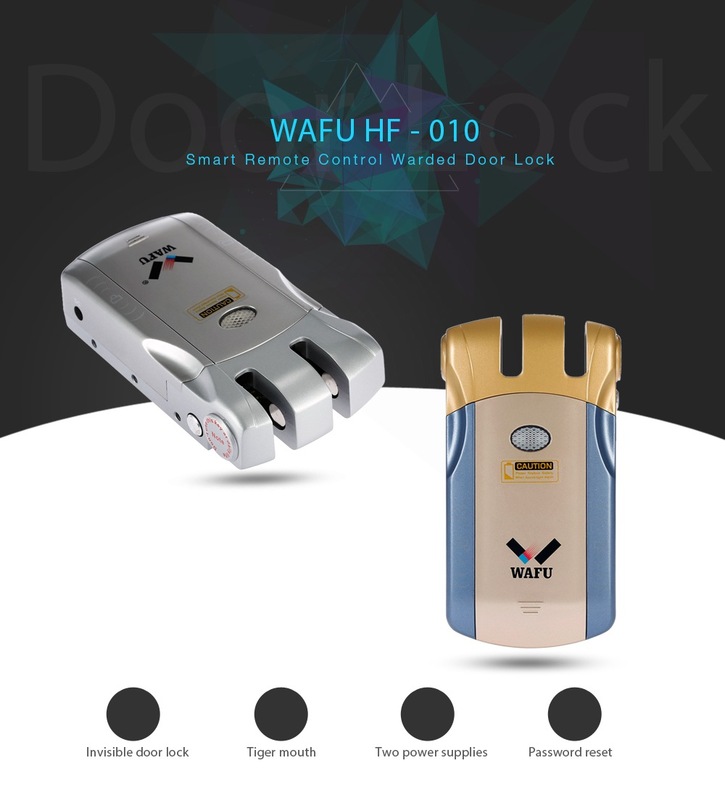 This WAFU HF - 010 Smart Warded Door Lock adopting the American microchip technology and the micro scroll password working principle, has realized a fully secure door lock system with its remote control technology. 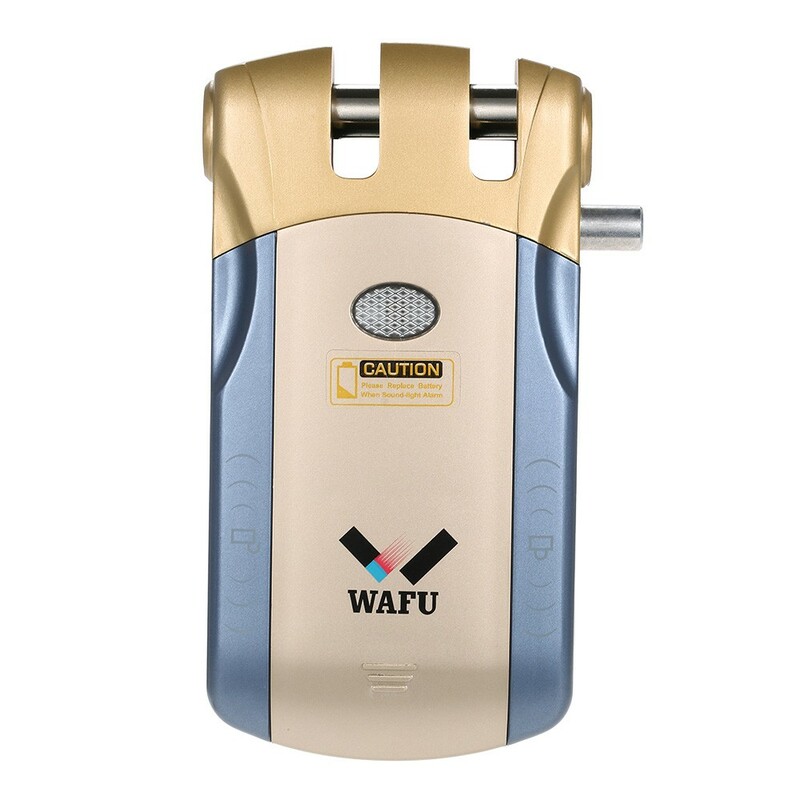 The WAFU Door Lock looks invisible on the outside, and is installed inside the room. 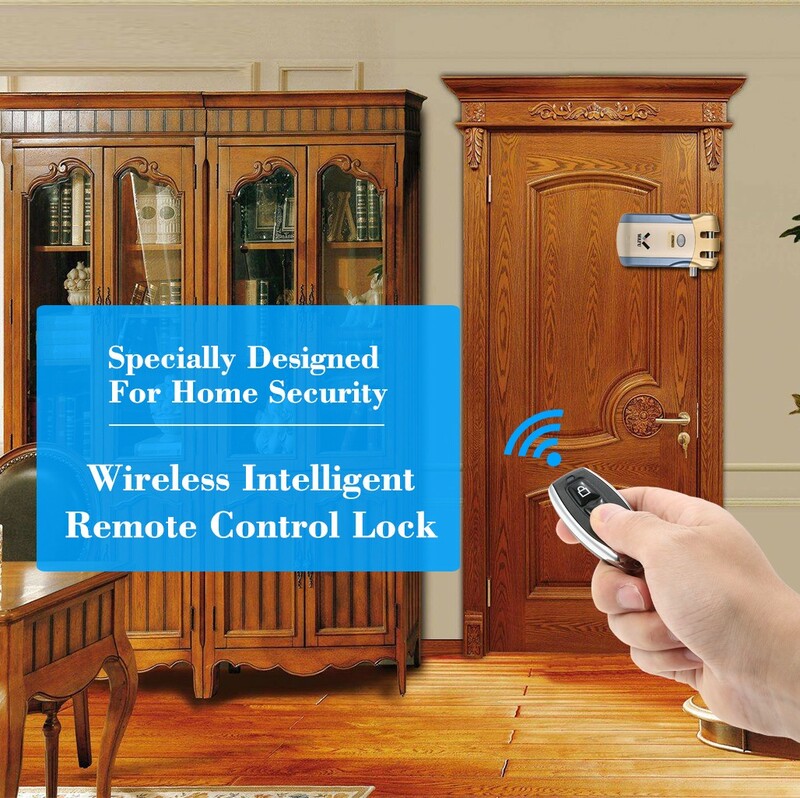 You can lock or unlock the door with the included remote control keys within 20 meters. 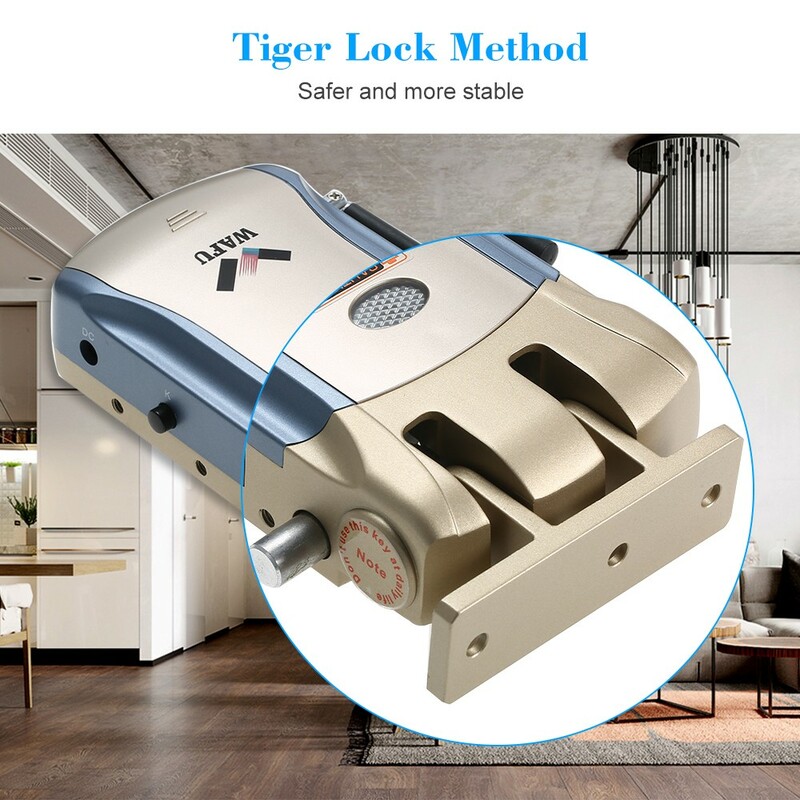 The Tiger Mouth featuring the prying-resistant, anti-pulling and clog-proof functions, can avoid that you unable to open the door caused by the heavy pressure. 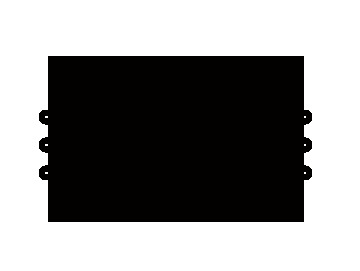 When you lose your key, you can change the password by registering the new one to make the old key out of work. 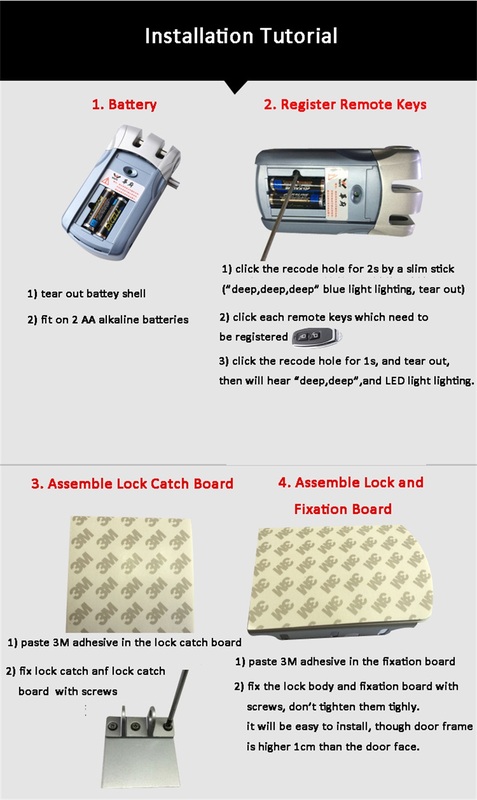 Two power supply methods and low battery alarm ensure your door lock always has enough electricity. 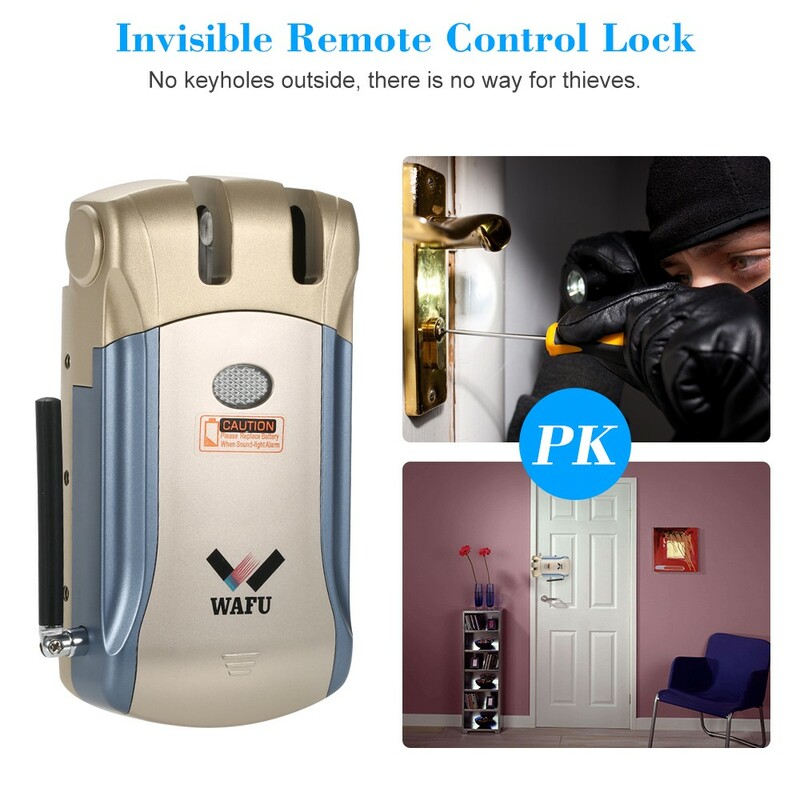 *Invisible remote control lock, specially designed for home security. 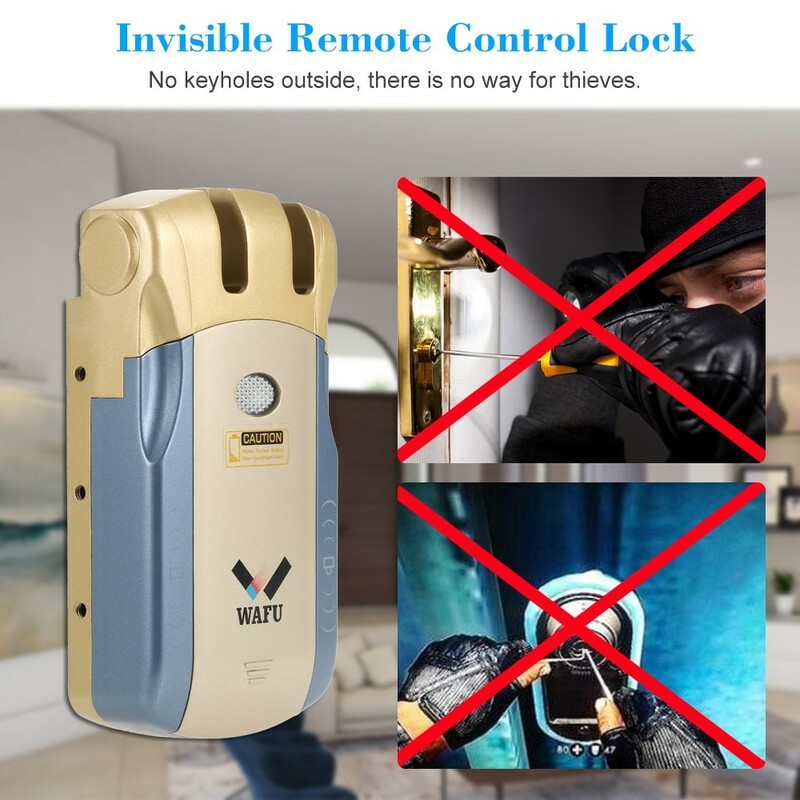 *No keyholes outside, there is no way for thieves. 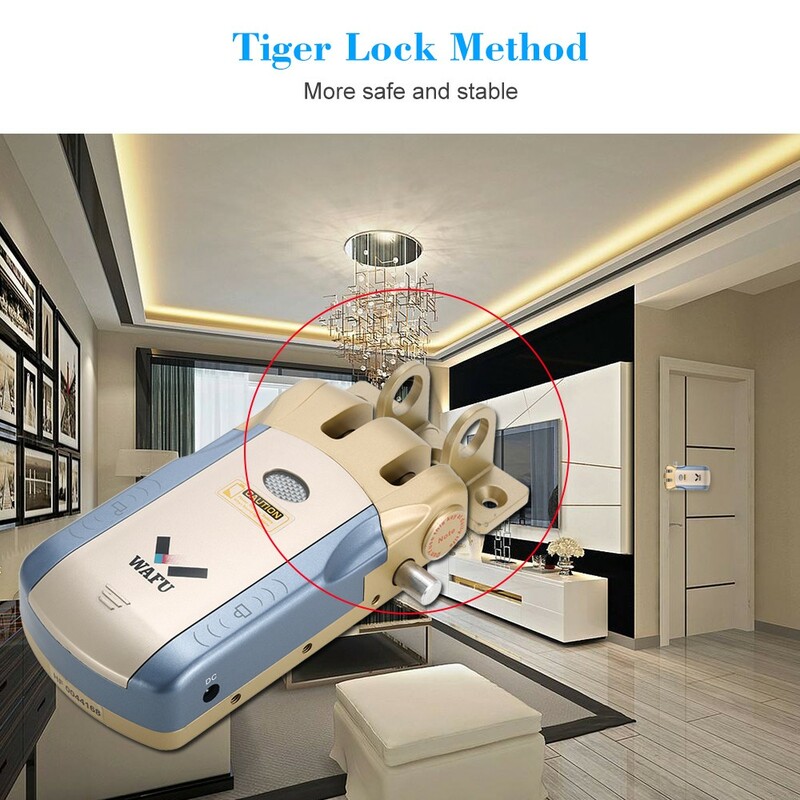 *Tiger lock method, more safe and stable. 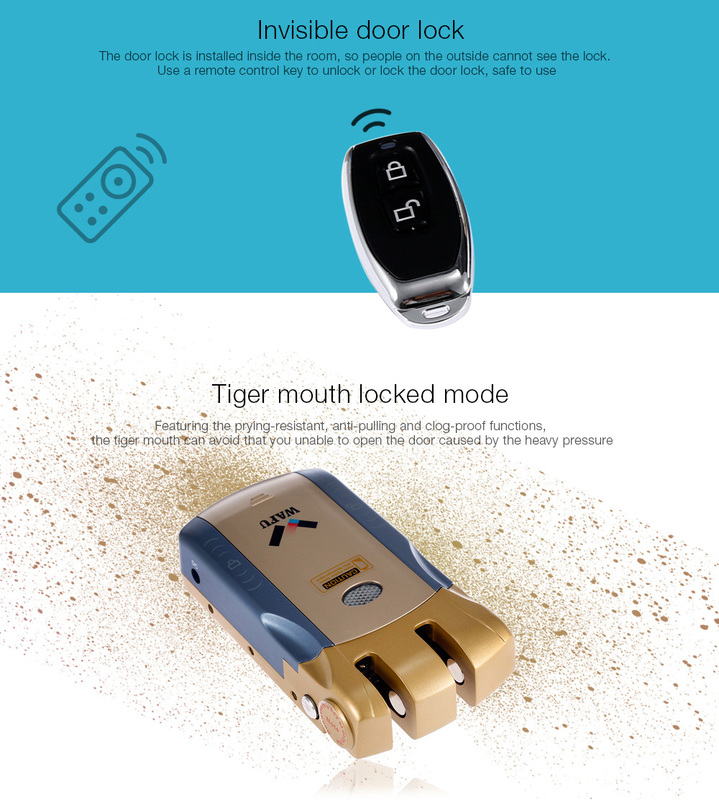 *It supports touch design, it can be locked and unlocked by touching the lock body when indoors. 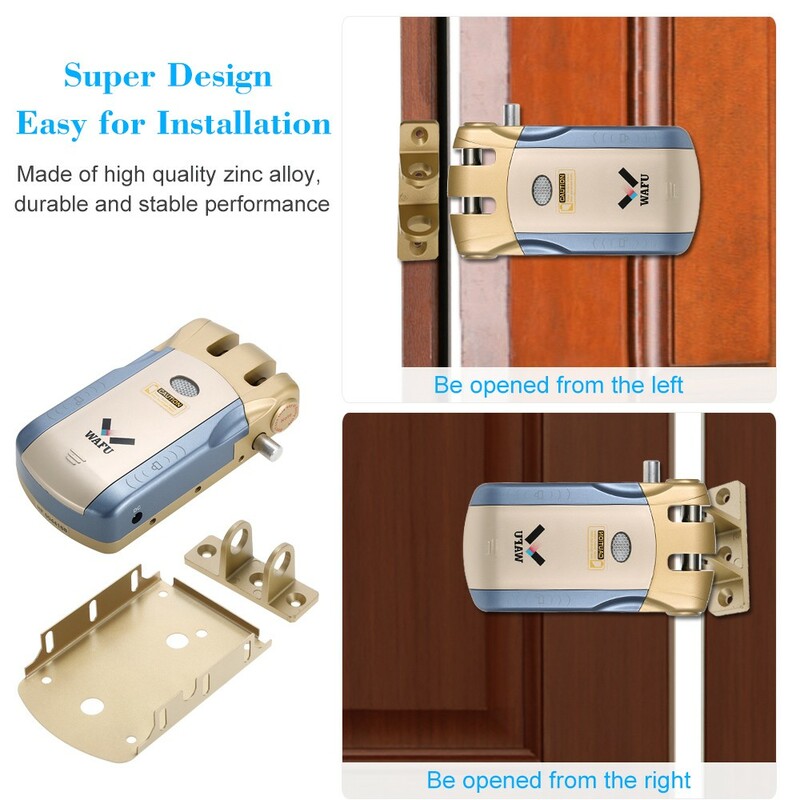 *Super design and easy for installation, made of high quality zinc alloy, durable and stable performance. 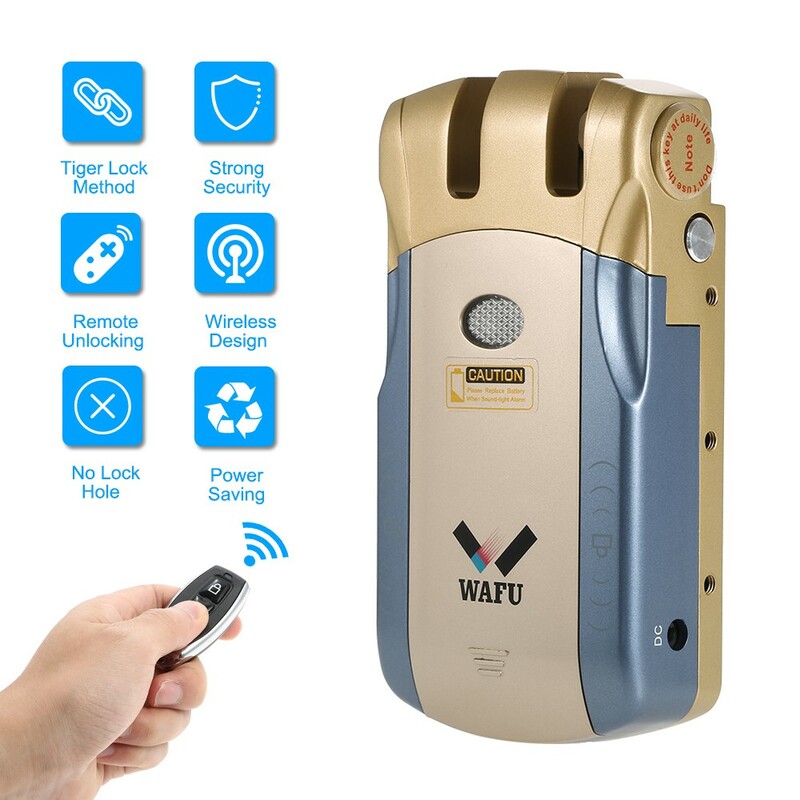 *Unique lock body structure mode, anti-jamming, anti-external damage, tamper, with indoor intelligent electronic manual off button, it can be directly activated smart off button when close the door, no need to find the remote control and turn off the remote control lock.